Human iPSC-Derived Neural Stem Cells (i-HNSC) are a homogeneous, self-renewing and multipotent population derived from control Human Induced Pluripotent Stem Cells (HiPSC). Under controlled conditions, i-HNSC possess the ability to consistently generate high yields of functional neural cells like neurons and glia. 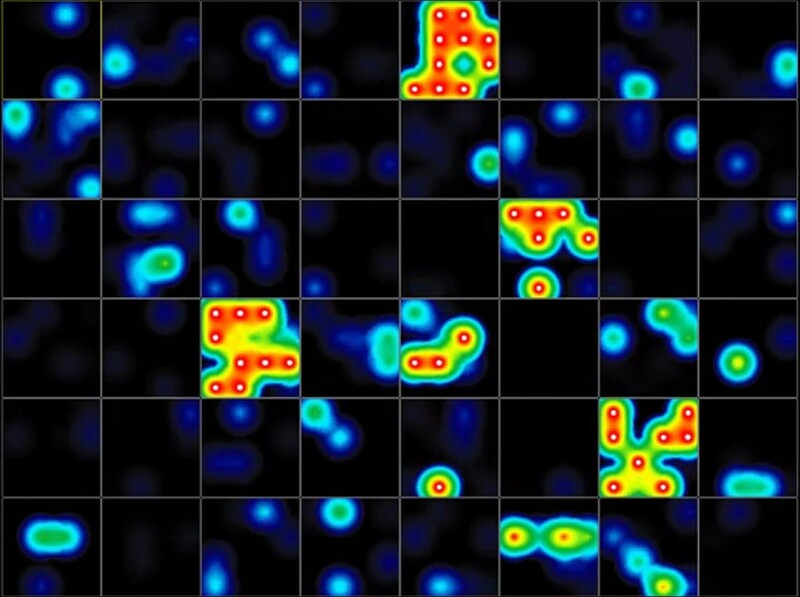 These i-HNSC provide researchers a unique model to study neural development, neurotoxicity, differentiation, electrophysiology, and disease modeling. Video: Multi-electrode array of i-HNSC-derived Neurons. Real-time MEA shows mature, synchronized networks, optimal electrophysiology & activity that can be modulated by neurotransmitters, small compounds. Figure: Differentiation potential of iPSC-Derived Human Neural Stem Cells: In optimal differentiation conditions, i-HNSC differentiate into neurons (microtubule-associated protein - MAP2) and astrocytes (Glial fibrillary acidic protein - GFAP). Nuclear staining with DAPI is included as a reference. Human iPSC-Derived Neural Stem Cells represent a physiologically relevant model. The discovery of safe and effective medicines depends on neuronal models with physiological and pharmacological properties resembling mature neurons in the human brain. Functionally mature human iPSC-derived neurons are essential to development of cell-based models with increased physiological relevance. 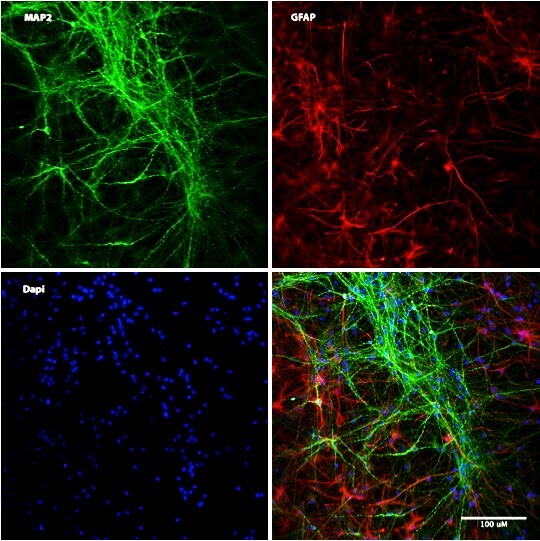 Human iPSC-derived neurons and astrocytes, when co-cultured in vitro, enhance neuron phenotypic maturation and long-term survival1,2,3. When cultured in defined differentiation media4, our i-HNSCs naturally generate a balanced population of neurons and astrocytes, providing a unique model that more closely resembles normal human brain physiology. i-HNSC and neurons derived from them are useful for drug screening and cell-based research & discovery. Next-generation manufacturing permits large quantities of cells to be produced from a single lot (donor) in a short period of time. Characterization. 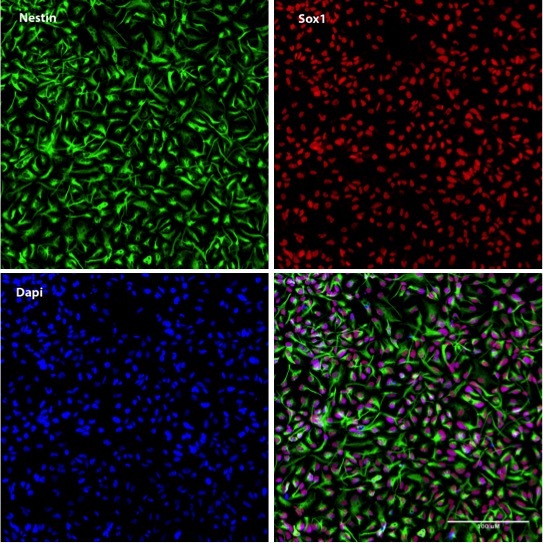 i-HNSC express typical markers of neural stem and progenitor cells such as Nestin and Sox1 with a purity greater than 90%. They are completely validated for viability, differentiation potential, karyotype, morphology, passage number, and sterility. Tang X, Zhou L, Wagner AM, Marchetto MCN, Muotri AR, et al. Astroglial cells regulate the developmental timeline of human neurons differentiated from induced pluripotent stem cells. 2013. Stem Cell Res 11, 743–757. Odawara, A., Saitoh, Y., Alhebshi, A. H., Gotoh, M. & Suzuki, I. Long-term electrophysiological activity and pharmacological response of a human induced pluripotent stem cell-derived neuron and astrocyte co-culture. 2014. Biochem Biophys Res Commun 443, 1176–1181. Fukushima, K., Miura, Y., Sawada, K., Yamazaki, K. & Ito, M. Establishment of a Human Neuronal Network Assessment System by Using a Human Neuron/Astrocyte Co-Culture Derived from Fetal Neural Stem/Progenitor Cells 2016. J Biomol Screen 21, 54–64. (Click to Enlarge) Induced Human Neural Stem cells (i-HNSC): i-HNSC express characteristic markers such as Nestin (cytoplasmic) and Sox1 (nuclear). Nuclear staining with DAPI is included as a reference.